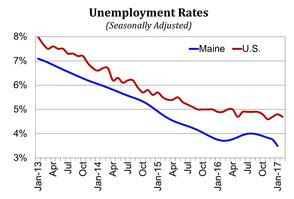 Maine’s unemployment rate is the lowest it’s been in 16 years. The state’s January unemployment rate of 3.5 percent is the lowest it’s been since March 2001, according to the Maine Department of Labor. The preliminary seasonally adjusted unemployment rate was down from 3.8 percent in December, down 1,300 people over the year to 24,300 in all. Economists generally consider 4 percent unemployment a natural benchmark because there are always people who are between jobs, not necessarily unable to find them. The figures were reached in conjunction with the U.S. Bureau of Labor Statistics, which set the national unemployment rate at 4.8 percent in January. In February, it fell slightly to 4.7 percent. Unemployment rates for other New England states were 2.7 percent in New Hampshire, 3.1 percent in Vermont, 3.2 percent in Massachusetts, 4.7 percent in Rhode Island, and 4.5 percent in Connecticut.